This is unusual for a 61. 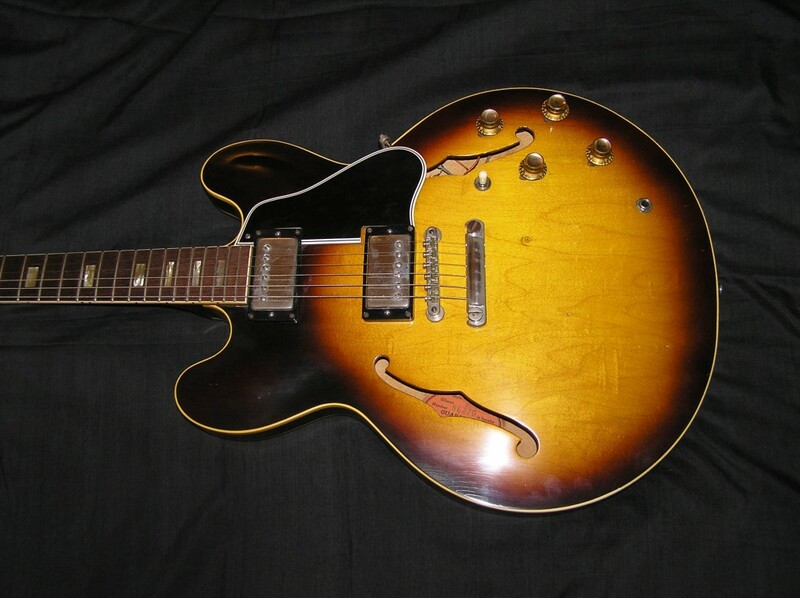 It has the long pick guard. There are 60 335’s with the short guard-plenty of them but long guard 61’s are not common at all. 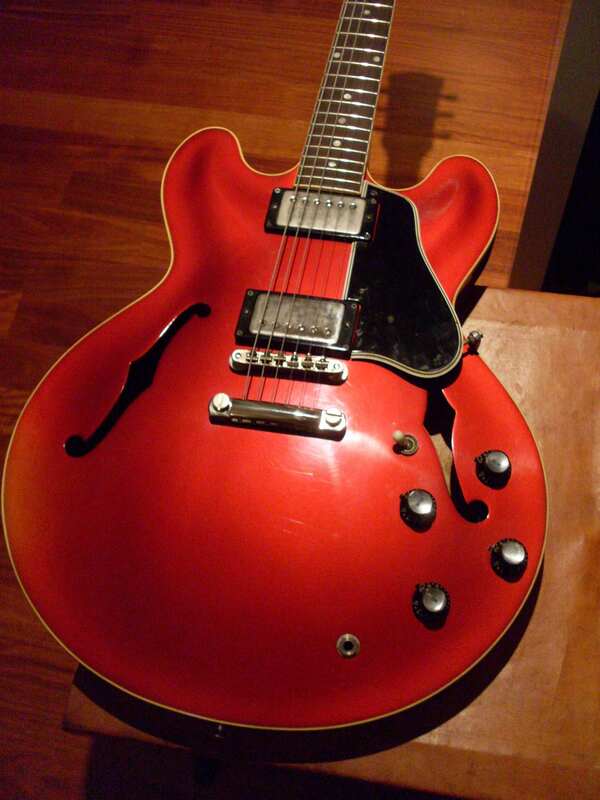 The best artist series guitar Gibson has ever made. They really got these right (except for the pickup covers which they never get right). Feels like the real thing, sounds like the real thing. Hard to believe these are ten years old already. They made 50 blondes in 58. Rarest of the production TDN’s. Not sure how many were bound neck and how many were unbound. This one lasted about an hour before it was gone. You won’t see another one of these anytime soon. 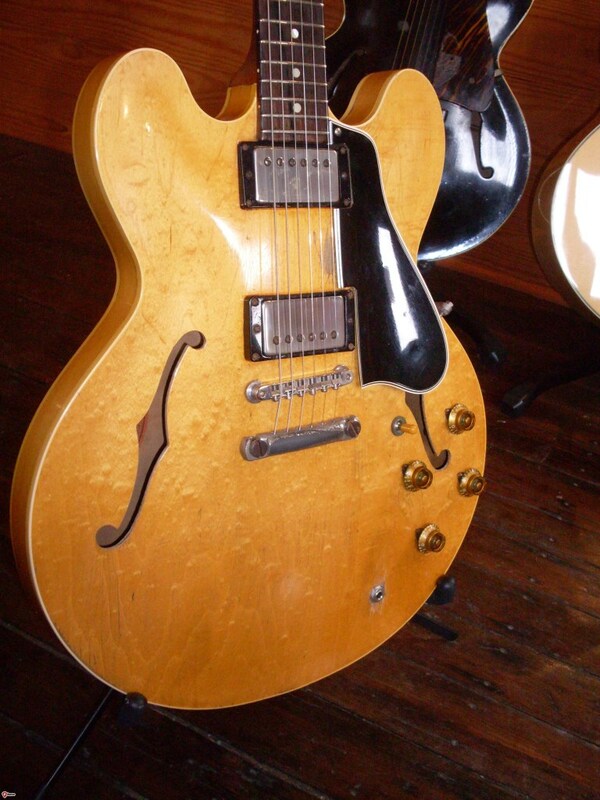 I know of just two early block necks in factory blonde. 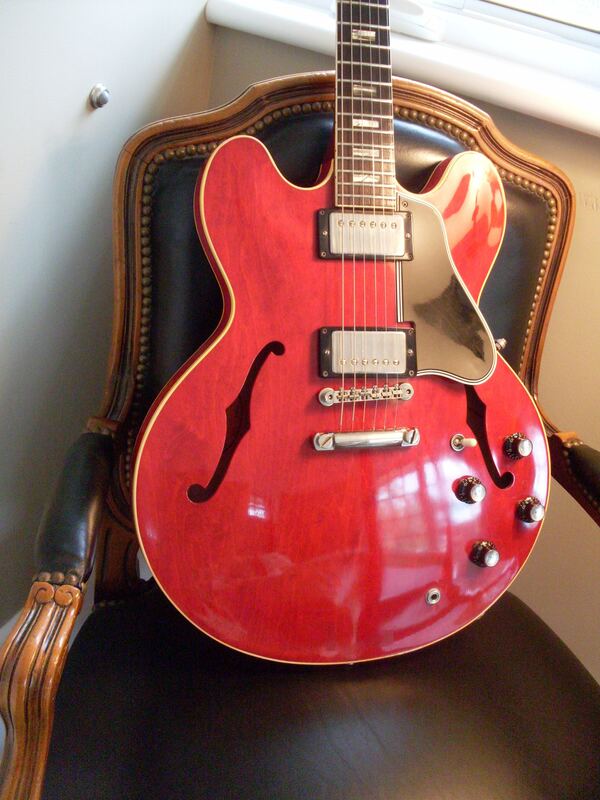 The other is a lefty 64 that lives about 15 miles away from me. 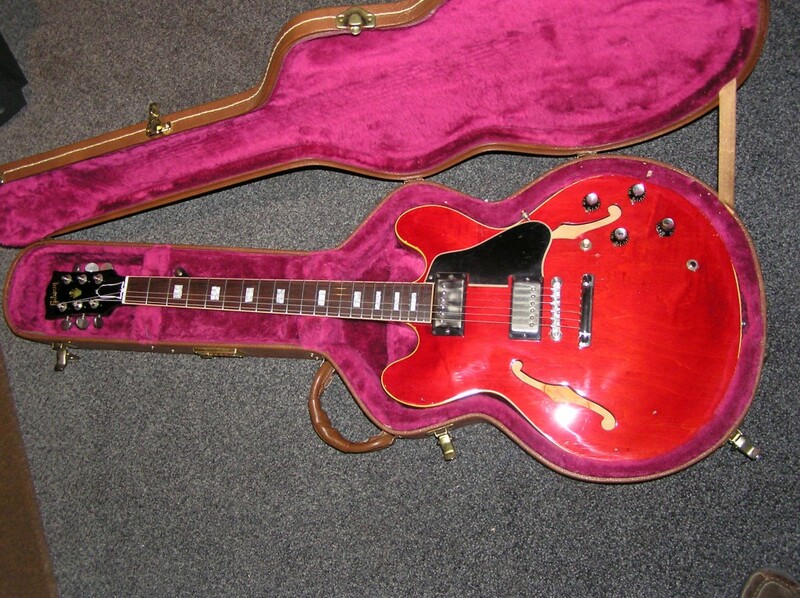 This is a 63. Real early (pre Mickey Mouse ear) unbound 58. This one still had its original uncollapsed thin ABR-1. Most of them collapsed within a year. 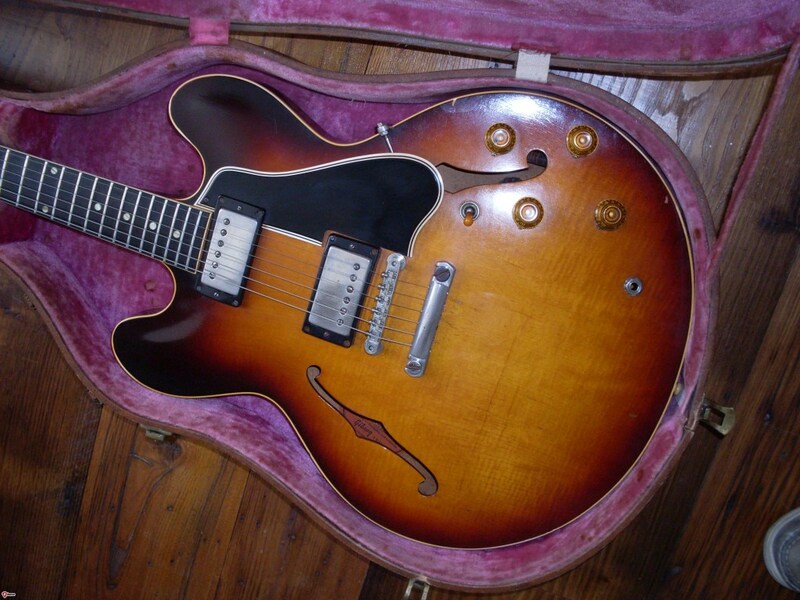 Killer 59 flame top. Not too many of these around and they are always dramatic and popular. This one came out of Kentucky. This flamey 60 was a great one as well. 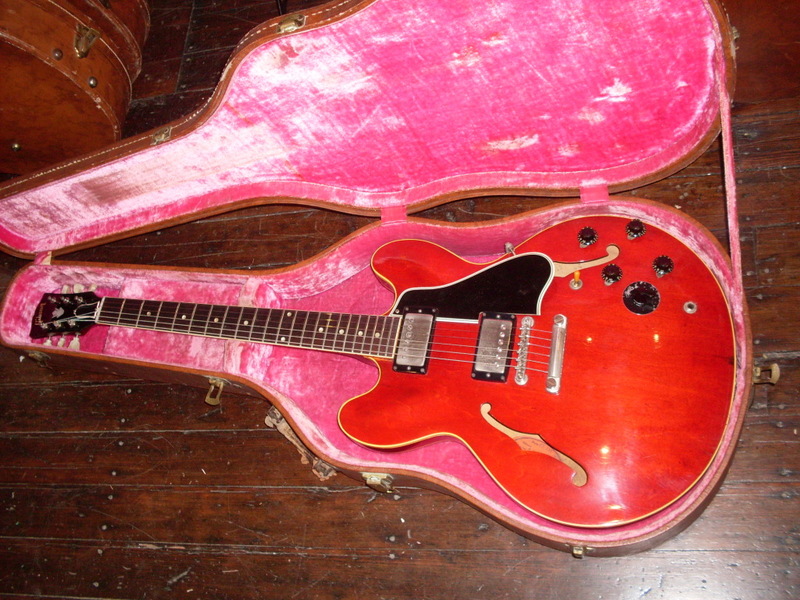 An early 60 with a big ol’ 59 size neck. Near mint (really near mint) late 58. No, the photo isn’t loaded backwards. It’s a lefty. Thanks to Alex. 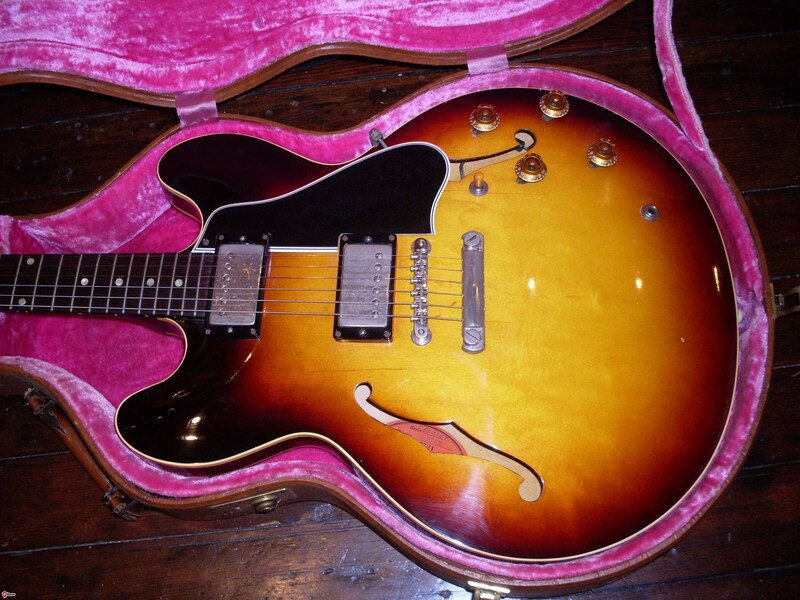 Killer flame top 59. 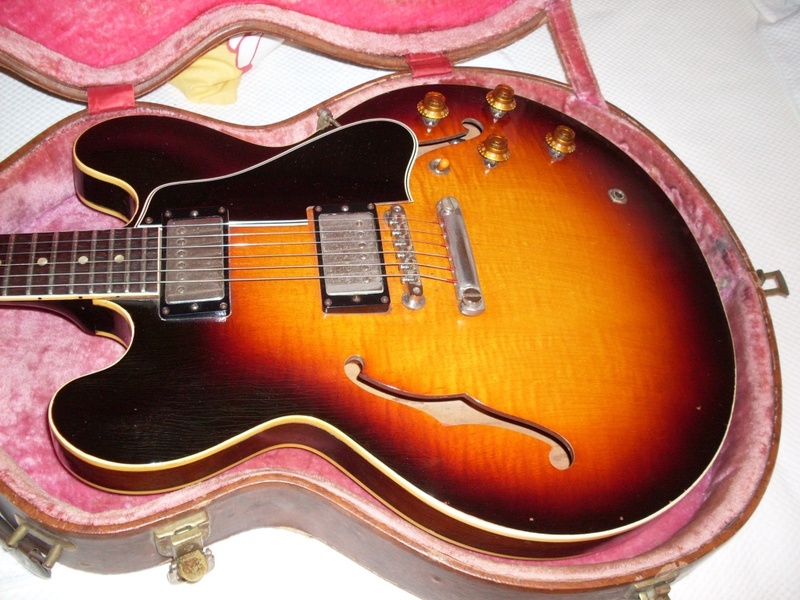 This had the big fat 59 neck even though it was pretty late in the year. It’s pretty random once you get past A3100 in the serial numbers. 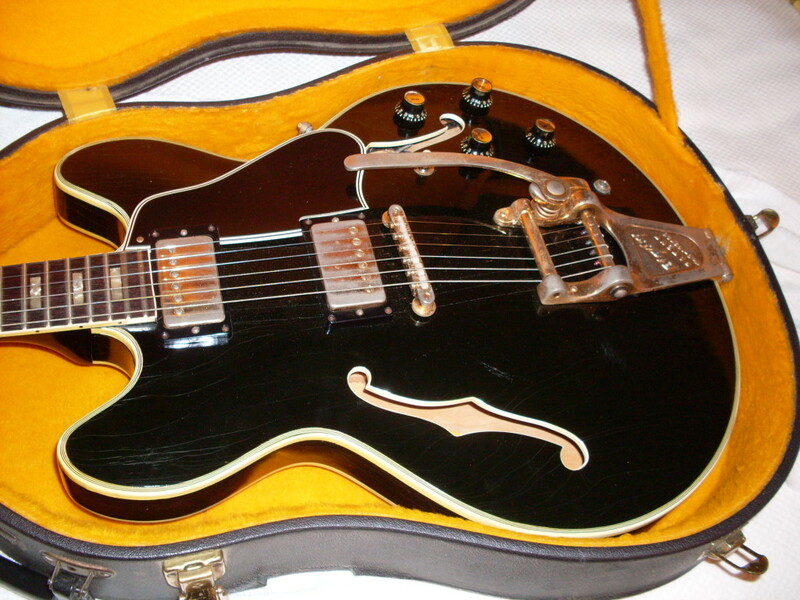 This is a factory black 1966 ES-335. 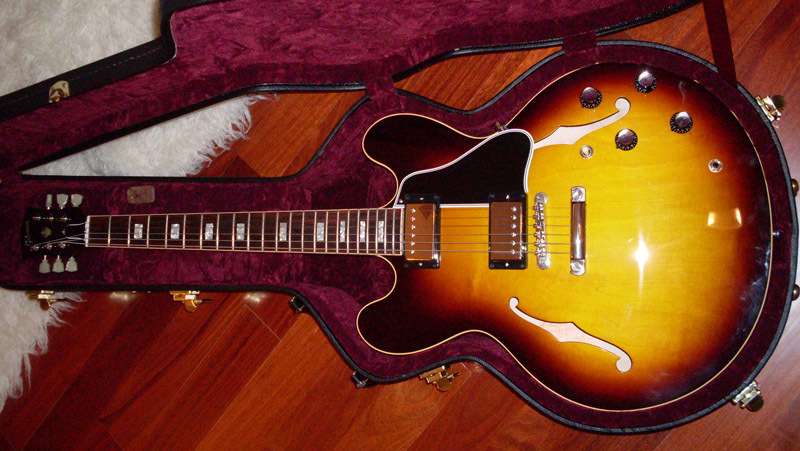 It is a true one off factory custom with ES-355 7 ply binding on the top, bound f-holes and gold hardware. 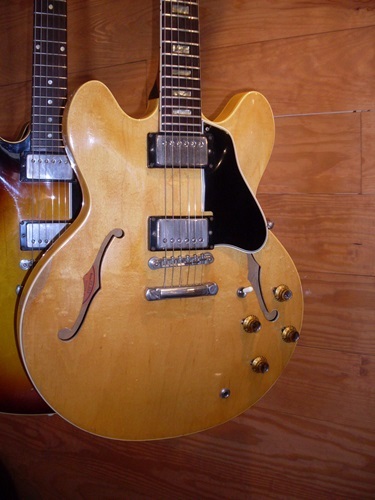 One of a kind unless you count the companion ES-330 that was ordered at the same time by the same buyer. I had that one too. Red59Dot is my user name on a number of sites. 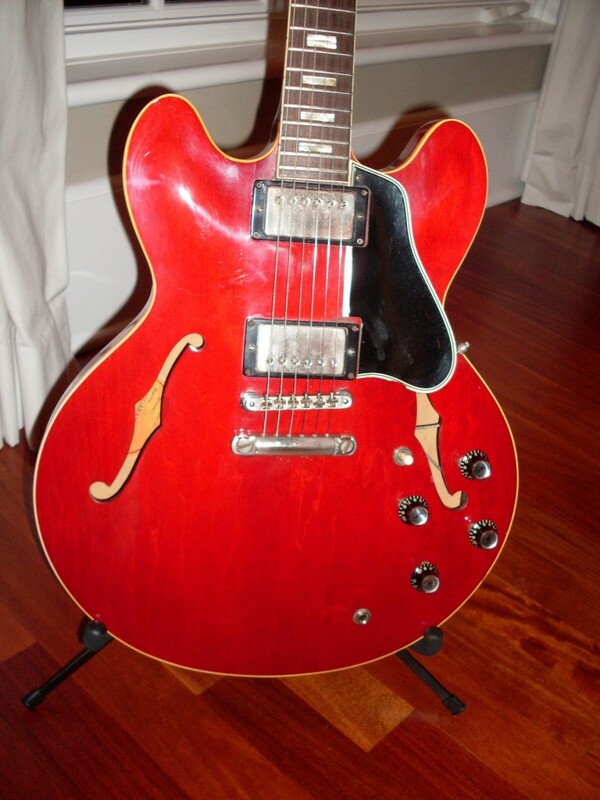 I chose it because I had been on a search for one of the elusive “not supposed to exist” red 59s. It’s like Bigfoot. Someone swears they saw one and it winds up being a moose or something (or a 60). This one is for real. This gorgeous unbound 58 belongs to a loyal reader who wishes to remain anonymous (so don’t go to his house and steal it). And who can blame him. Nice birdseye. 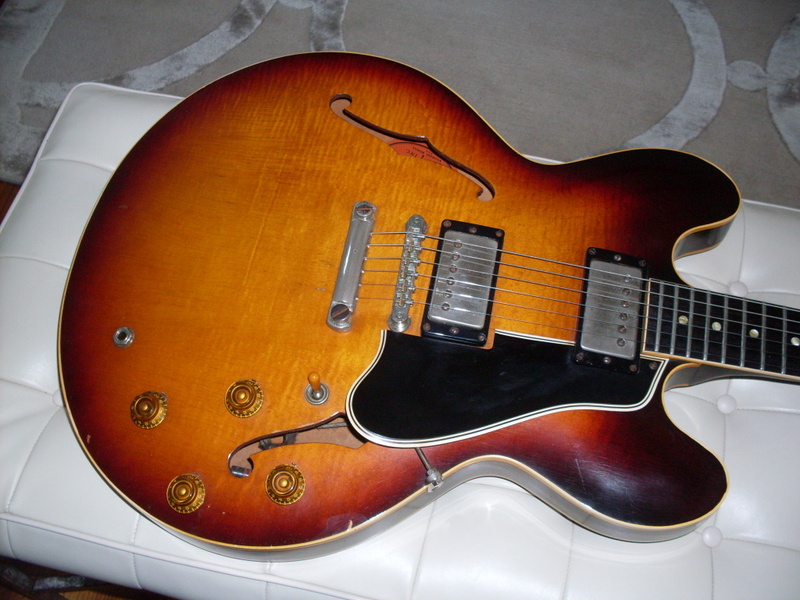 58’s have a thinner top which makes them unique among 335’s. 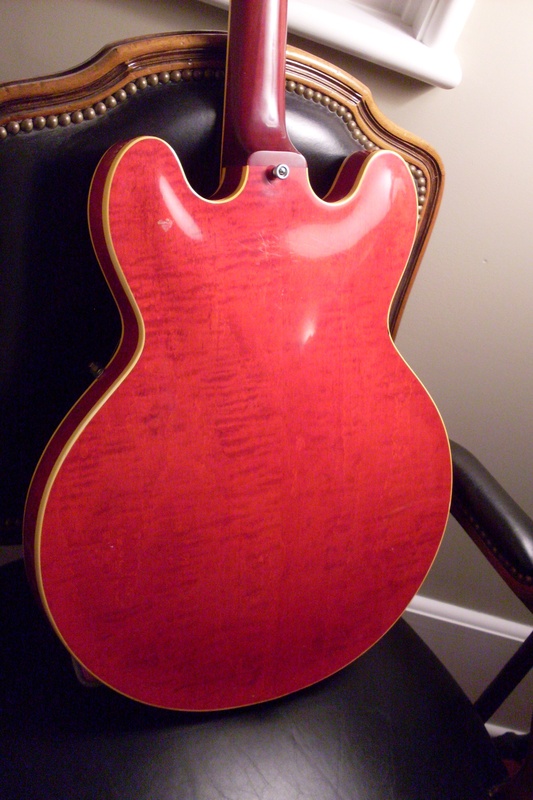 This really pretty 61 dot neck comes from reader Steve N. Note how different the red is compared to the 59 above it with the “watermelon fade”. 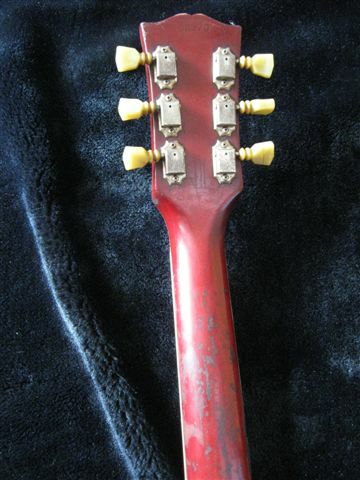 Gibson changed the red dye so it wouldn’t fade so much (same one they used on Les Paul bursts which faded as well). A 61 dot neck in red. Played but still rockin’ after 50 plus years. Just like me. 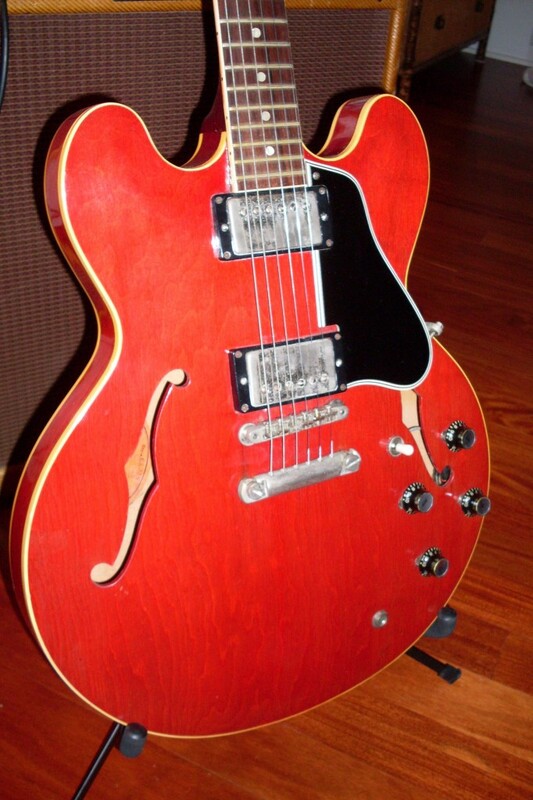 This is a really great 62. 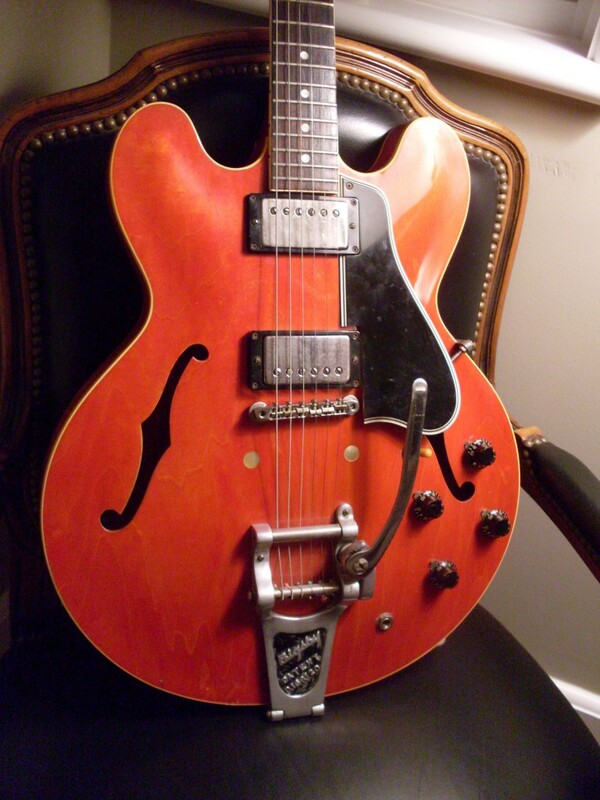 It came from the factory with a sideways trem so no holes in the top. Excellent condition and a bigger neck than most 62s. Not quite a 64 size but pretty big. Sideways is in the (not original) case. PAFs, too. This one went to the UK. Check out the flame on the back of this 61 dot neck I found in Montana recently. Too bad the front doesn’t have the same wood. 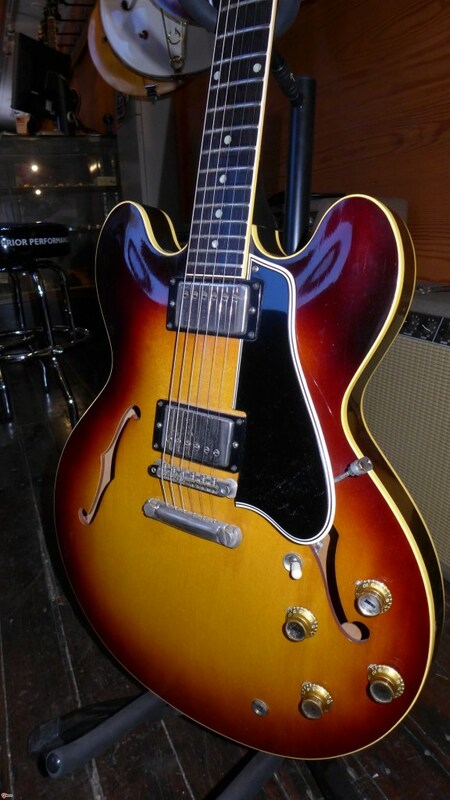 This one’s got a couple of issues but it’s a great player in beautiful shape. It’s my current favorite, so don’t buy it yet. 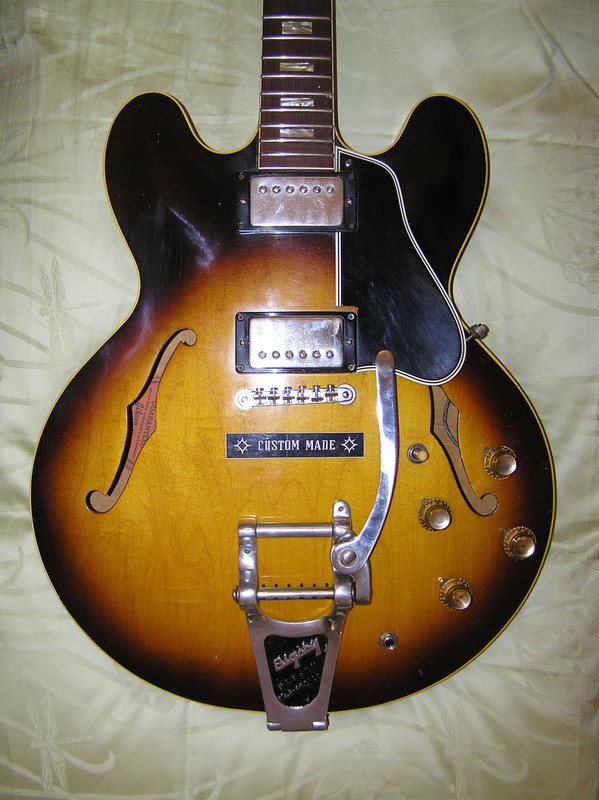 Here’s a 62 dot neck-one of the last of them as they switched to blocks in early 62. 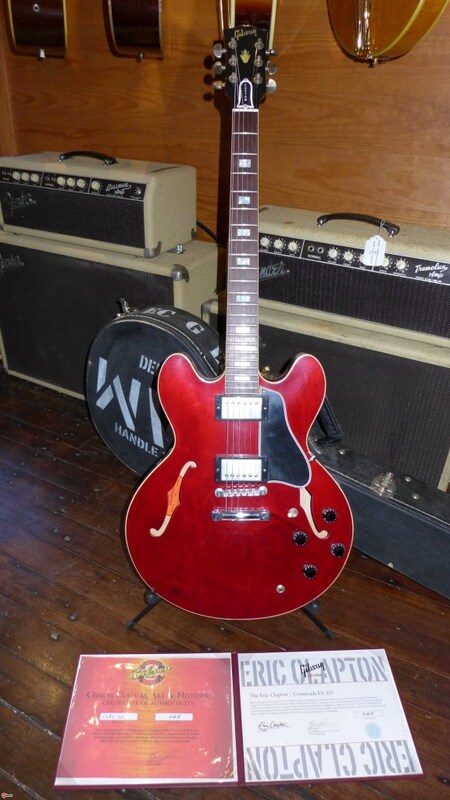 This one had the misfortune of being painted candy apple red or it could have gone back to Gibson to be refinished in “Sparkling Burgundy” which it could definitely be. This was an astonishingly good player. 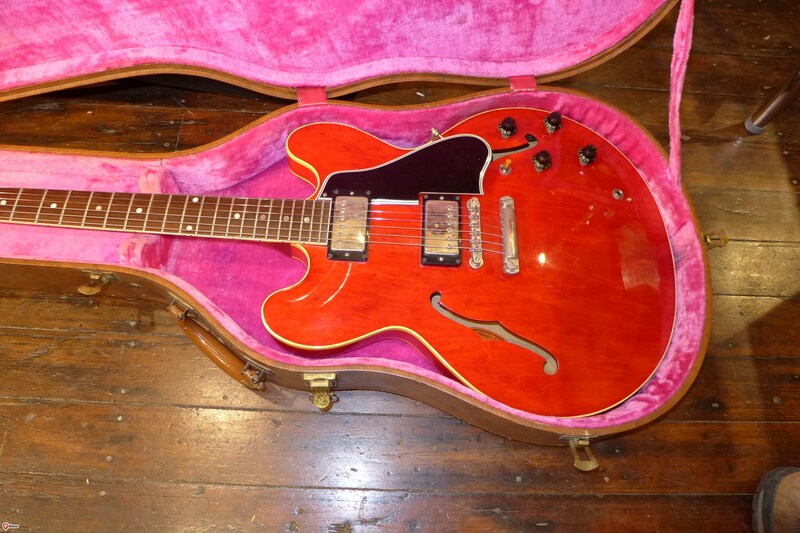 So, it’s got a headstock repair. It happens. get over it. 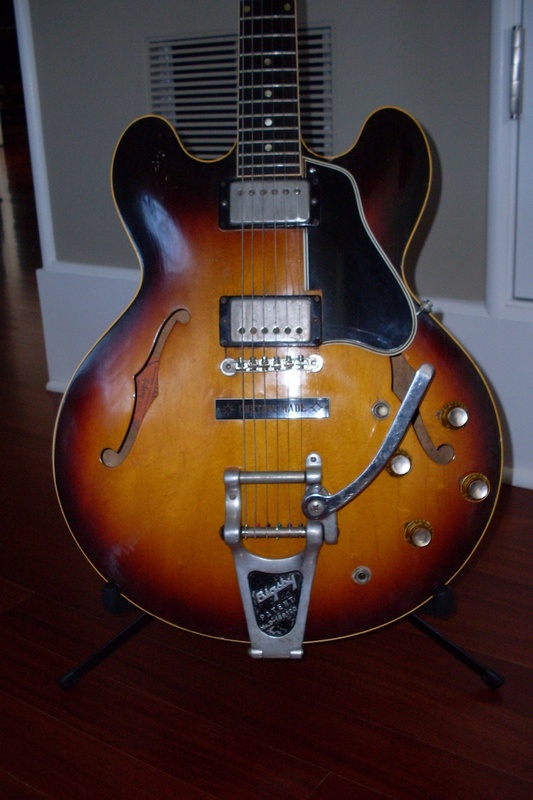 Still a very cool fiddle and a great, great player. This one came from Phoenix. 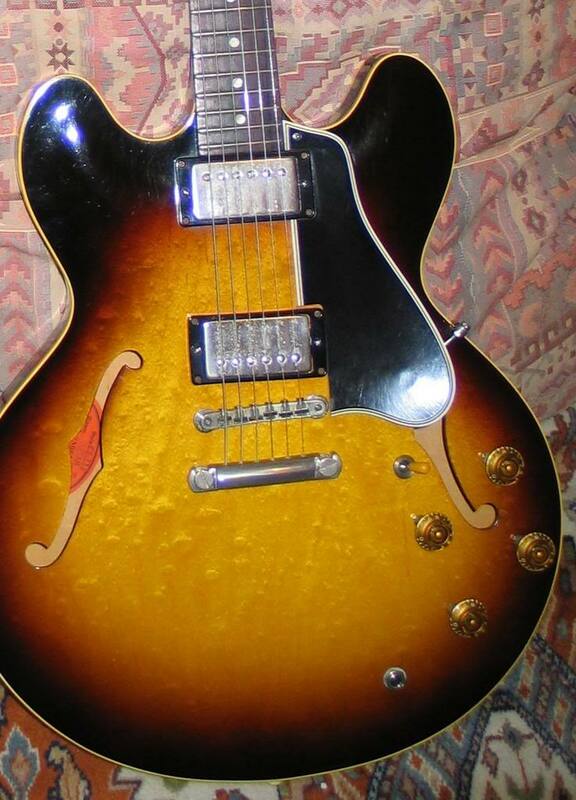 Here’s a Pretty Cool 1964 ES-35. Serial number is only 23 away from Claptons which sold for over $800,000. Shipped the very same day: May 20, 1964. 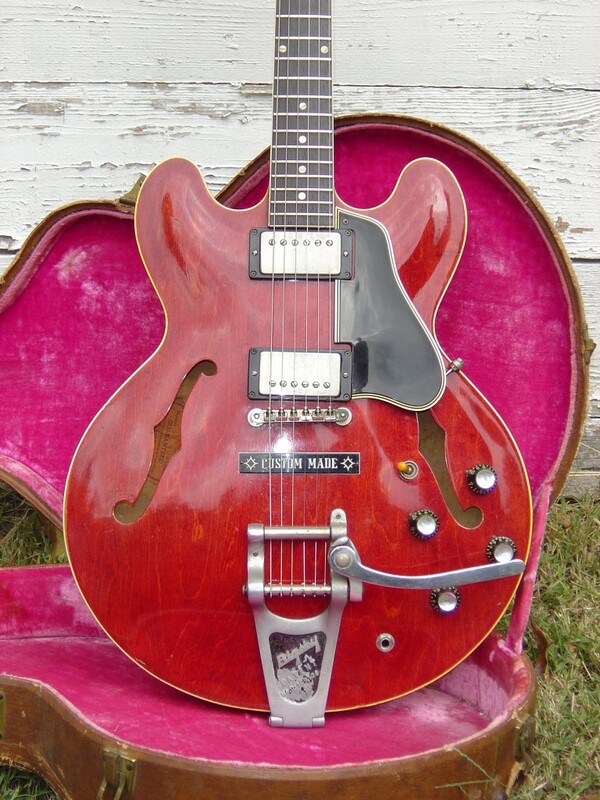 I love 64s and I love guitars with a backstory. 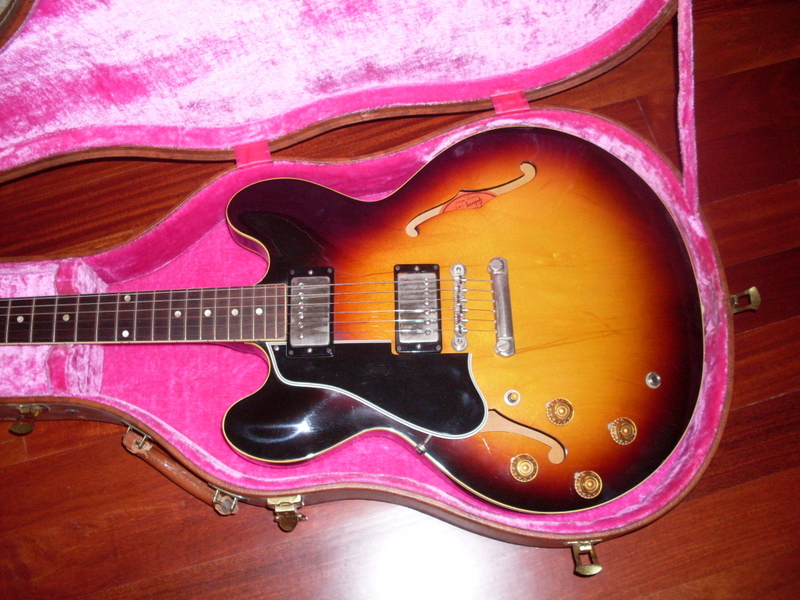 This 64 belongs to my friend Andreja who lives in Serbia-these guitars don’t always stand still for 45 years. 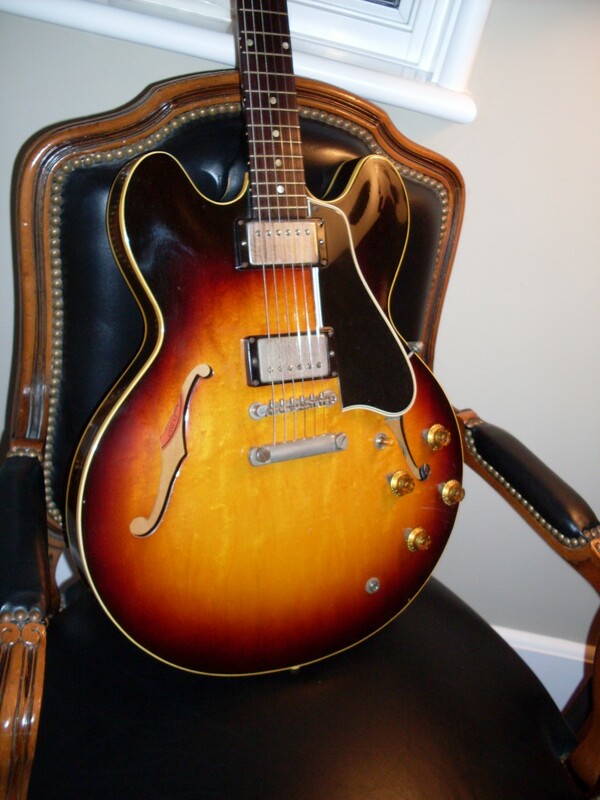 This guitar is supposed to have belonged to Denny Laine (Wings) at one point back when every Brit had to have a 335 in his arsenal. Same guitar as above. This must be a good one. A well worn 335 almost always is a good playing good sounding 335. Otherwise, it wouldn’t get played so much. Nice site and best of all it appears you do know your stuff. I got a blonde 1984 “dot” yesterday. The older gentleman I bought it from said it had literally lain under his bed for at least the last two decades and I believe him. It is in excellent condition. 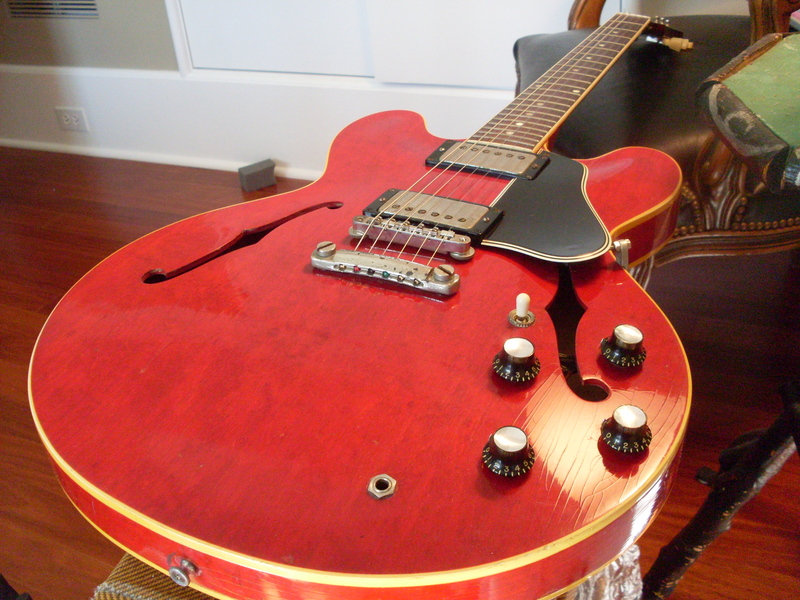 He said he changed the bridge (the original’s in the case pocket) and the knobs (originals gone). 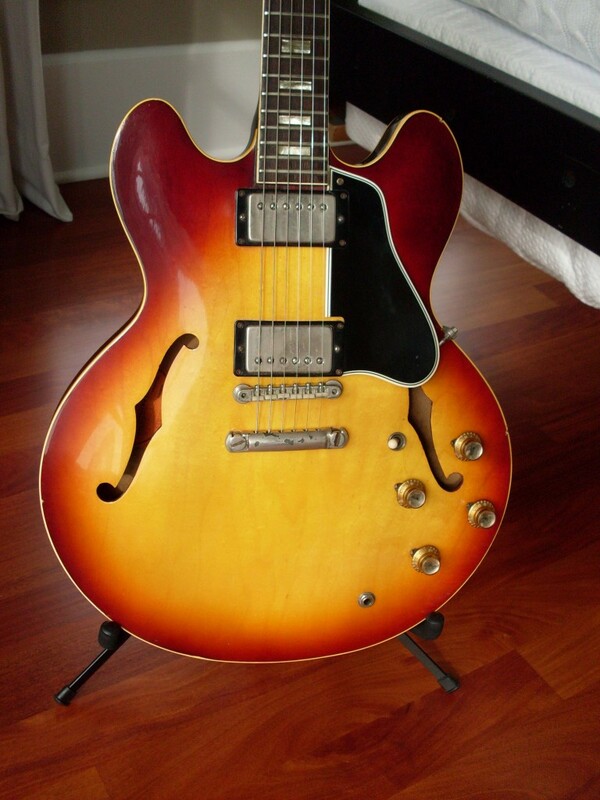 Question: what style knobs were original to this year & model 335? 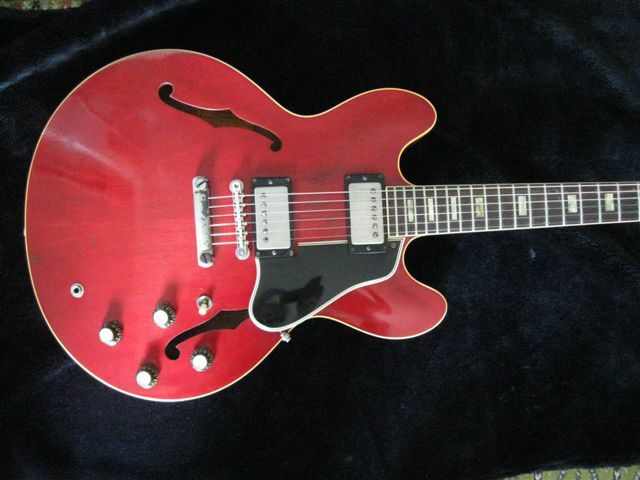 I need to sell a friends ES 335 for him, serial number A245635. It’s in perfect condition no scratches or dings and the action is buttery smooth. Can you help me with the year it was made and it’s worth? Send a photo to okguitars@gmail.com. The serial numbers were used multiple times in the 60’s. Could be a 64 or a 65. It could also be from the early 70’s. Big difference in value. 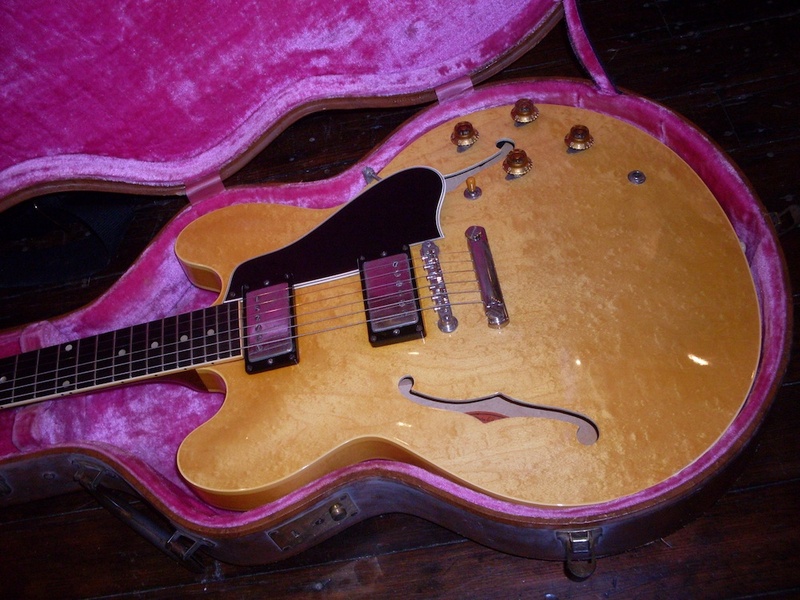 Gold bonnet type knobs were used on blondes.They are darker than the ones from the late 50’s. I have a set from an 82 if you need them. Not expensive.